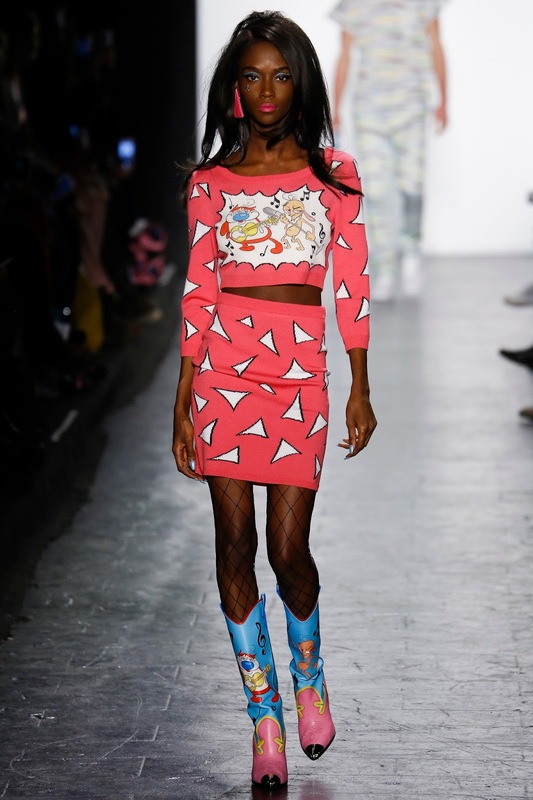 Is what Jeremy Scott named his latest Fall 2016 Ready-to-Wear Collection, showcased at NYFW. 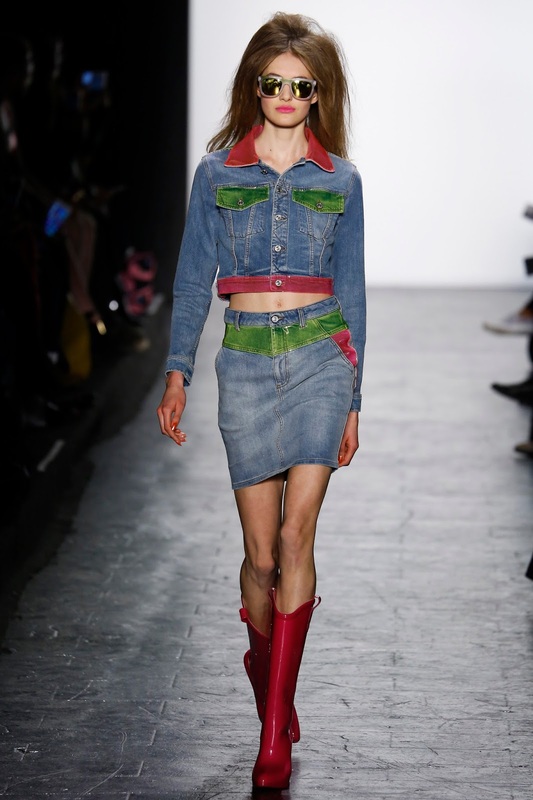 The name was in reference to the cowgirl theme he opted for this season, and how the girls get "done up" with the voluminous hair and bright makeup. He also said backstage that he wanted to bring an outer space influence into the collection and I think that was evident with the metallics, bright colours and the overall flamboyant feel of the collection. The theme was of course very suited to Jeremy Scott's brand image not only for his namesake brand, but for Moschino too. The two brands have similarities in terms of the fun, playful and creative elements that they possess. 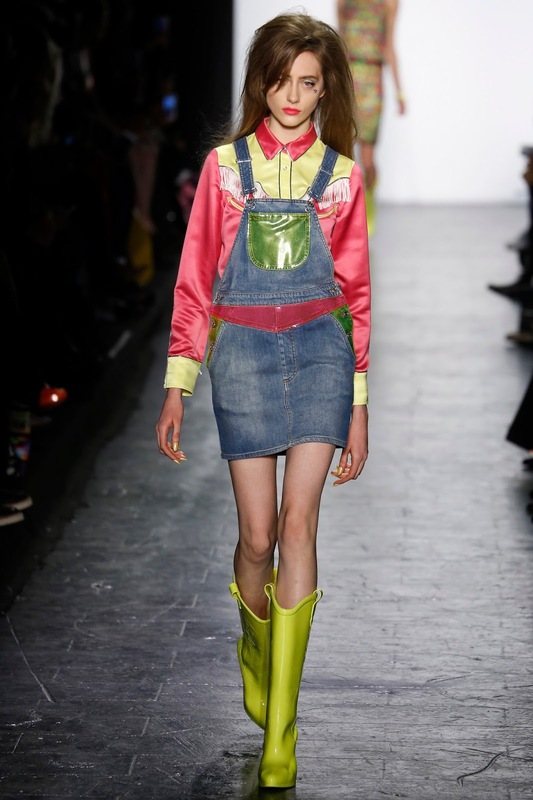 It is all part of his vernacular and that is exactly what makes Jeremy Scott different from other designers in the industry. He said backstage that he contacted Cartoon Network to draw up some characters and scenes which would be featured on the garments. These were on the cowboy boots, on the back of jackets as well as being plastered over jumpers and tops. 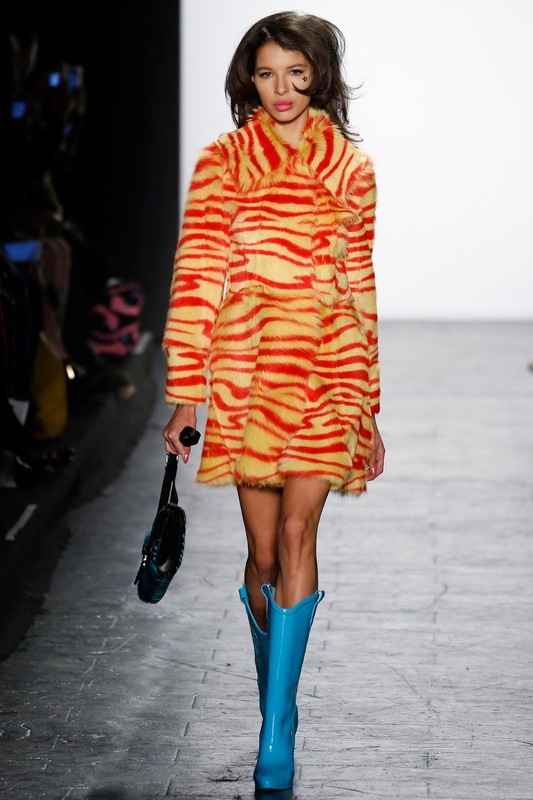 It truly was a fun and eccentric collection, but that is exactly what Jeremy Scott does best. 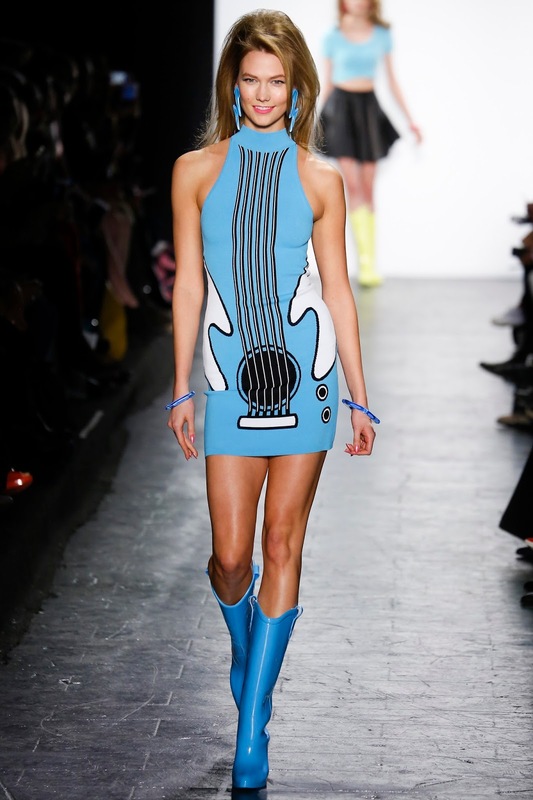 He presented his pieces in acid-toned colours, from a bright orange and yellow fur zebra coat teamed with acid blue heeled wellington boots to a baby blue guitar printed dress, graced down the runway by the gorgeous Karlie Kloss. It was her first Jeremy Scott show and she was honoured with the job of both opening and closing the job, and she looked incredible. 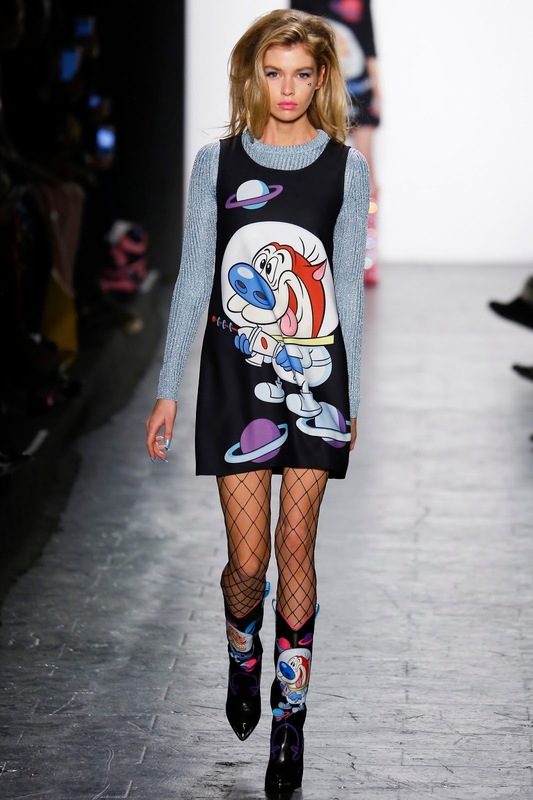 The cartoonish feel has been introduced by Jeremy Scott at Moschino so it was fantastic to see that again here in New York. He included the famous cartoon characters, Red and Stimpy which really upped the fun feel. I feel that Jeremy knows exactly what his clients want, and he is always delivering the best he can, whilst being effortlessly playful and fun. He included top trends we had seen in Pre-Fall, but with of course that eccentric twist. He opted a new take on fringing, putting white fringing on the side of bright orange leather trousers and giving us a gorgeous crystal embellished skirt with fringing at the bottom. It truly was a great collection, if you're style is very out there and outgoing. 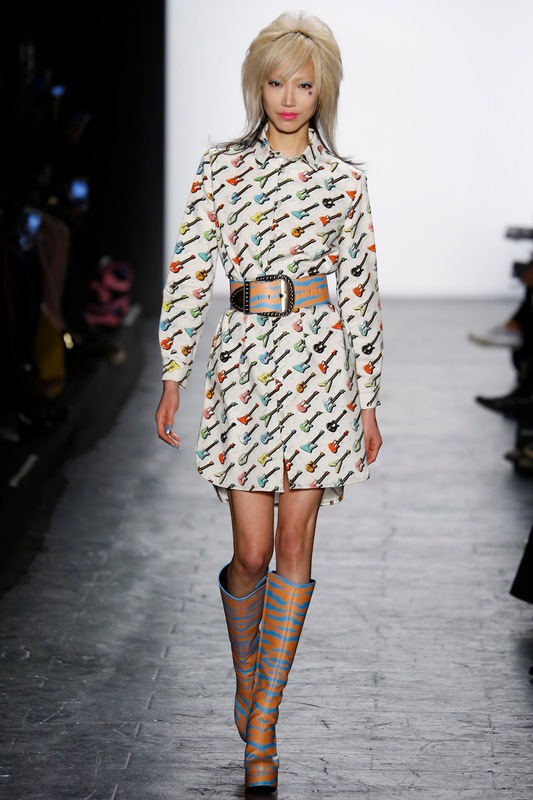 Jeremy Scott also stated backstage that he was trying to project a "Dali on Molly" vibe. He really brings the American optimism to his collections which I think makes his brand so popular and well loved.